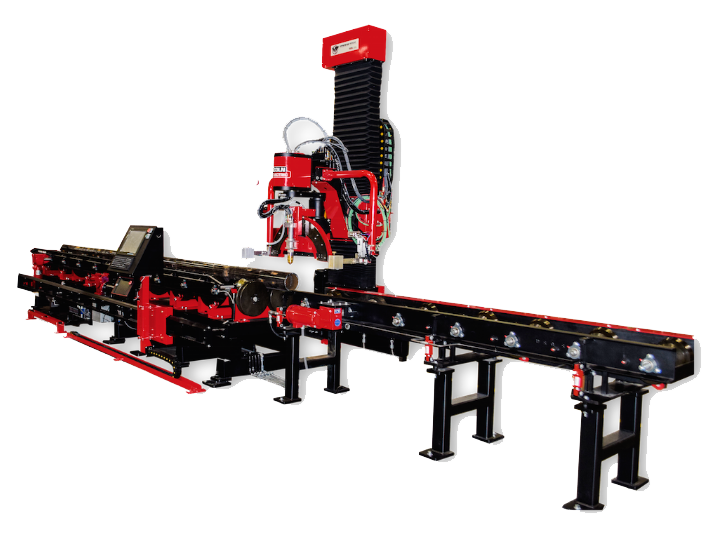 Convey raw metal pipes onto the machine bed to be cut and profiled by a single operator. Roller bed CNC pipe profilers have proven to be more efficient and safer for all involved. Pipes are fully supported in the cutting bed. The Vernon Tool MPM is a robust and proven pipe profiling solution that has been known to last 50+ years in the field. The build and design of this industrial CNC pipe cutting machine will be sure to stand the test of time in some of the harshest cutting environments on the planet. Whether your pipe cutting application requires oxy-fuel or high definition plasma cutting, you can rely on the Vernon Tool MPM to consistently provide high quality beveled cuts. Machines are available in 4 and 5 axis configurations, with expandable machine beds and conveyor lengths to fit your business’s unique layout. Professionals are standing by to discuss an industrial pipe profiling system that would be best for your business. Call us today at 775-673-2200. Material handling can make up for a large portion of the time invested in processing pipe. Vernon Tool decreases this time through the implementation of conveyors and roller beds. This combination fully supports the material during cutting. Two operators can operate the machine safely and efficiently. The Vernon Tool MPM is designed for this process by powerful conveyors to load the pipe into the cutting bed. It’s safe, efficient, and easy to implement. Check out our time studies to see how the Vernon Tool MPM pipe cutting machine can further optimize your facility’s operations. Call us today at 775-673-2200. You have a variety of financial service options to make it easy to choose the financing plan that's right for you! Call a sales representative today to find out more 1-866-571-1066. Click below to Request a Quote today!